1What Is The MYM Business Credit Builder Program? You purchase Monopolize Your Marketplace's Flagship Marketing Advice Program—1a downloadable audio file with over 11 hours of the best marketing training on the planet—for 4 monthly payments of $59.99 (and $19.99 per month after that for MYM Insider Webinar Vault access, if you choose the Long-Term Credit Building Plan). We report your monthly payments to CreditSafe. 2Just So I’m Clear… I Pay Monthly Installments On The Marketing Program, And You Report Those Payments To Credit Bureaus? 3What’s Different Between The Two Payment Plans? 4 monthly payments of $59.99 toward MYM’s Flagship Marketing Advice Program. Credit reporting for 4 months to 20+ credit bureaus on CreditSafe. Audio download of Monopolize Your Marketplace’s Flagship Marketing Advice Program—a groundbreaking program covering EVERY relevant marketing topic in 11 hours of audio, 94 tracks, and a supplemental 44-page workbook of examples and worksheets. $389 in FREE bonuses, including The 5 Biggest Marketing Mistakes audio program ($99 value), 6 downloadable audio volumes of MYM Insider Vault Top 10 ($140 value), and an in-depth review of one of your marketing pieces ($150 value). Long-term credit reporting to 20+ bureaus on CreditSafe. Instead of just 4 months of reporting, you get 28 months of reporting to build a longer, better, more substantial credit history. We find that businesses get the most benefits from the Long-Term Credit Building plan. The long-term plan builds stronger credit than the Quick-Build plan. The foundation you build for your credit with the long-term plan will help secure your success for the future. 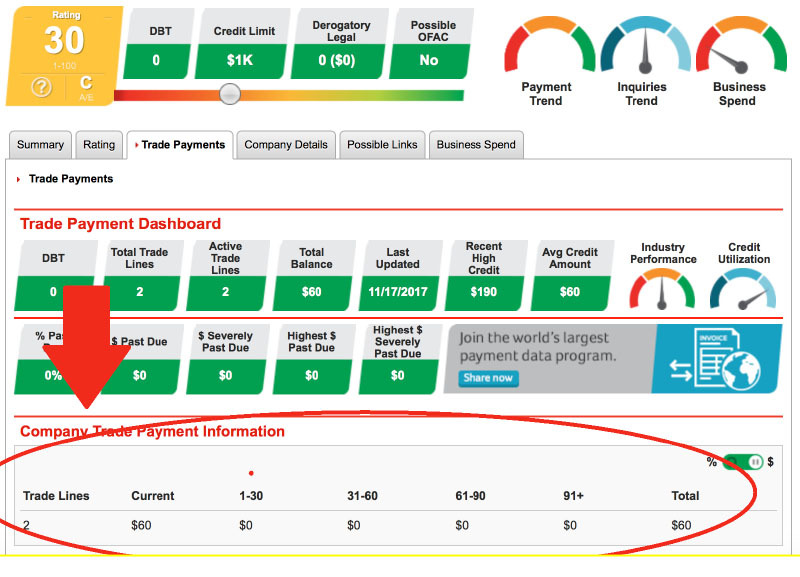 5If I Choose The Long-Term Credit Building Option, When Do The $19.99 Payments Start? The $19.99/month payments for MYM Insider Webinar Vault Access start after the four $59.99/month payments for the Flagship Advice Marketing Program. So on the 5th month of the Long-Term Credit Building program, your $19.99/month payments kick in. You will NOT be billed $59.99 and $19.99 in the same month. 6What Does The $19.99/Month MYM Insider Vault Access Get Me? Exclusive admission to an online portal containing 122 of MYM’s best marketing webinars. You won’t find this invaluable information anywhere else! Click here for more details. 7How Do I Make My Payments? The card you used when you signed up will be auto-billed 30 days from sign up and every month after. 8When Is The First Payment Due After I Order The Program? An initial onetime $4.95 set-up fee is billed to your account immediately. Thirty days after sign up, the credit card you used for the program will be automatically debited. 9When Will My Account Start Reporting? Reporting will begin the month after your first payment. It is submitted by the 20th each month and uploaded to the bureaus on or about the 25th of the month. 10How Often Do You Report? We report every payment starting the month following sign up. For instance, if you make a payment on June 20th, we submit that payment to CreditSafe on July 20th. 11What If My Payment Declines? The card will automatically try to run again 24 hours later. If the card still declines, it will try one more time after another 24 hours. If the credit is still declined after these two automatic retries, we will reach out by phone or email within one to two days of the decline. If we don’t hear back from you, we’ll follow up two more times. If payment is still unresolved and the next payment declines (30 days), we’ll report the payment as default. 12Can I Make A Payment Early Or Pay For The Program Up Front? No. Payments need to be made every 30 days in order to report as a Net 30 account. 13Can I Cancel My Payments At Any Time? No. Think of this as a credit-line extension. As such, the prerequisite to qualify is agreement to make ALL payments for whichever of the two Credit Building options you choose. For example: if you choose the Long Term Credit Building option, you MUST make all four $59.99 monthly payments and all 24 $19.99 monthly payments. Otherwise, your credit building progress will be null and void. 14What Credit Bureaus Do You Report To? We report to CreditSafe, who partners with over 20 of the most reputable credit bureaus in the industry. 15Do You Report To Experian? Because of privacy and non-disclosure agreements, CreditSafe cannot reveal their specific partners. But they report to 20 of the most reputable credit bureaus. 16Do You Report To Dun & Bradstreet? Not directly. To get your payments reported to D&B, contact D&B via phone, online chat, or the contact form on their website. Give them your Credit Builder account number and our address. D&B will add your Credit Builder account to their profile. 17Where Is My Download For MYM’s Signature Marketing Advice Program? The screen to download is on the Order Confirmation page once you purchase the program. There is also a link in the Order Confirmation email you received at the time of purchase. If you did not receive an email or download the program from the Order Confirmation page, contact us at info@mymonline.com or (817) 416-4333. 18How Do I Log In To My Account? After you signed up, you should have received an email with a username and instructions on how to log in. Click here to go to the log-in page and input your username and password. If you did not receive the email with log-in instructions—or have forgotten your log-in info—contact us at info@mymonline.com or (817) 416-4333. 19How Do I Update My Form Of Payment Or Information? Click here to go to the log-in page and enter the log-in information you were given at sign up. Once you have logged in, you will see links that allow you to update your account information. You can also email accounting@mymonline.com to change your payment method and any information. 20Where Can I Find You On My Credit Report?